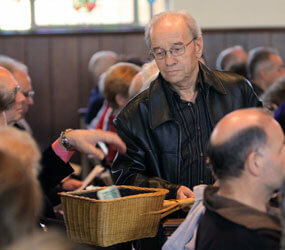 WASHINGTON – Catholic parishes seemed to have weathered the recession of 2008, according to a study issued April 27. The study, “Holy Toll,” conducted by the Hartford Institute for Religious Research, part of the interfaith Hartford Seminary in Connecticut, noted that more than half – 57 percent – of Catholic parishes said their offertory collections had declined either “a lot or a little” during the recession. According to the National Bureau of Economic Research, the recession began in December 2007 and ended in June 2009. The Catholic numbers, gleaned from earlier research conducted by the Center for Applied Research in the Apostolate at Georgetown University in Washington, also said 13 percent of parishes studied indicated their offertory revenues had dipped but then rebounded, while 30 percent said they saw no change or had grown. Asked about their current financial situation, an equal percentage of parishes – 40 percent each – said it was “good or excellent” or “tight,” while the remaining 20 percent said their parish was experiencing “some” or “serious” difficulty. Frank Butler, executive director of Friends and Donors Interested in Catholic Activities, or FADICA, told Catholic News Service in an April 26 telephone interview that the size of Catholic parishes compared to congregations of other faiths may help shield it from the impact of an economic downturn. By contrast, Scott Thumma, an author of the “Holy Toll” study and sociology professor at Hartford Seminary, said during an April 27 conference call with reporters that the largest 10 percent of Protestant congregations would be any with more than 350 families, but together they would encompass about half of all U.S. Protestants. The study’s principal author, David Roozen, director of the Hartford institute, said during the conference call that Protestant congregations, irrespective of the occasional “megachurch,” are slowly moving toward a Catholic model because of size concerns. FADICA’s Butler told CNS that his impression on Catholic parish giving is that “they’re holding their own,” although Catholic Charities groups are suffering from increased demand and fewer resources, due to cuts in federal, state and local budgets that would contract with Catholic Charities agencies to provide specific services to people in poverty. Noneconomic factors that could affect giving, such as the clergy sexual abuse crisis, have already been tallied, Butler said. “Other than in archdioceses that have been intensely hit with the abuse crisis, there are measurable outcomes there in terms of giving, and that’s to be expected,” he said. “Some (Catholics) are outraged. You’ll be able to measure that in terms of pew count and donations. According to “Holy Toll,” the percentage of congregations reporting a dip in collections during the recession ranged from 46 percent (three denominations) to 83 percent (Conservative Judaism). Those who saw collections decline but then rebound ranged from 5 percent (Churches of Christ) to 15 percent (Orthodox Christian). The percentage of those who saw either no change or growth ranged from 10 percent (Conservative Judaism) to 47 percent (two denominations). As to current financial health, those denominational groups saying they’re good or excellent range from 17 percent (Conservative and Reform Judaism) to 56 percent (Baha’i). Denominations reporting that things are tight range from 27 percent (Muslim) to 47 percent (four denominations). Groups saying they’re experiencing difficulty range from 2 percent (Churches of Christ) to 48 percent (Conservative Judaism).